Affordable and Feature-Rich Voice over IP (VoIP) Eliminate compromise on voice quality or features for phone and fax capabilities associated with Internet voice over IP (VoIP) service. Cisco® VoIP solutions provide the quality, peace of mind, and investment protection at an affordable price. 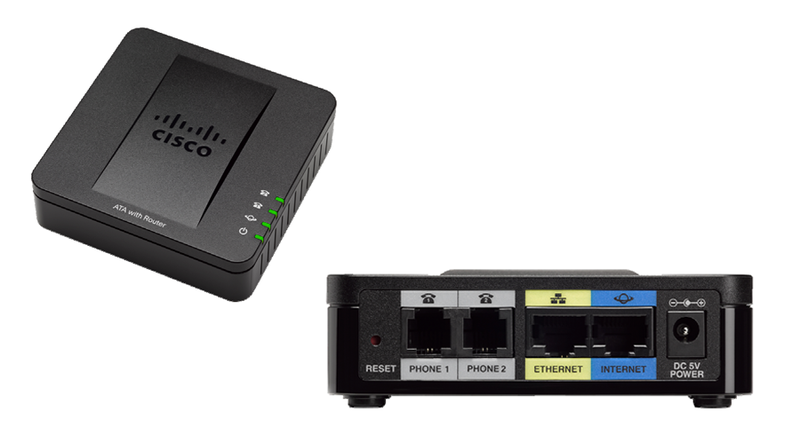 The Cisco SPA122 ATA with Router combines VoIP services with an internal router for LAN connectivity. Easy to install and use, it works over an IP network to connect analog phones and fax machines to a VoIP service provider and provides support for additional LAN connections. The Cisco SPA122 includes two standard telephone ports to connect existing analog phones or fax machines to a VoIP service provider. It also includes two 100BASE-T RJ-45 Ethernet ports for WAN and LAN connectivity. Each phone line can be configured independently. With the Cisco SPA122, users can protect and extend their investment in their existing analog telephones, conference speakerphones, and fax machines, as well as control their migration to IP voice with an extremely affordable, reliable solution. Compact in design and compatible with international voice and data standards, the Cisco SPA122 can be used with residential, home-office, and small business VoIP service offerings, including full-featured hosted or open source IP PBX environments. This easy-to-use solution delivers advanced features to better connect employees and serve customers, all on a highly secure Cisco network. This product replaces part # SPA2102-NA.